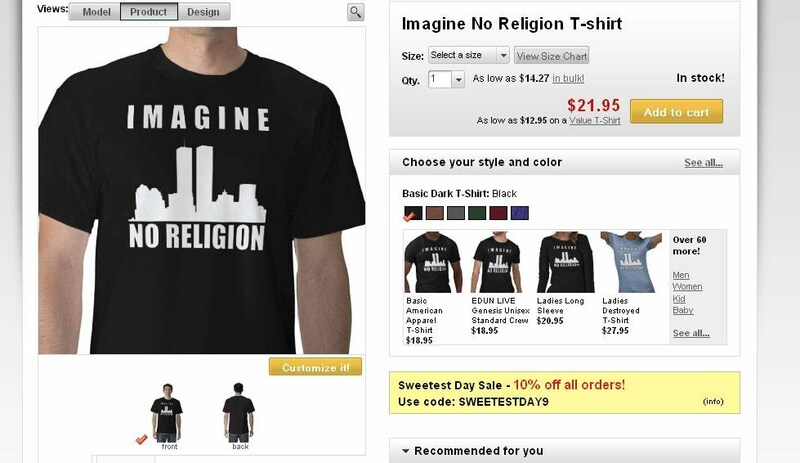 An Atheist community has launched a campaign against religion with T-Shirts that look strikingly similar to the “Investigate 9/11″ T-shirts that truthers wear. If this campaign catches on, it can be assumed that anyone wearing a 9/11 truth shirt will be lumped in with atheists. This needs to be stopped. All 9/11 truthers should be aware of this and if they see any of these shirts around, they should engage them. All the more reason truthers should be engaging these atheists not because of their belief about religion, but because this shirt is suggesting that fundamentalist Muslims were behind 9/11. This says they no nothing about the events of that day and that they are perpetrating an opportunistic behavior to take advantage of the “establishment version” of 9/11 and use it to justify pushing their beliefs on people. Bush did this by using 9/11 to justify war against millions of innocent Muslims. There is no difference between politicians taking advantage of the propaganda of 9/11 to push tyranny on the people and atheists taking advantage of the propaganda to push their beliefs on people. The website pushing this manipulative campaign is Zazzle.com. These shirts look very similar in fashion to the investigate 9/11 t-shirts from We Are Change.